I Wish (or Miracle, as the original title Kiseki translates to) is mainly the stories of two brothers Koichi And Ryu (played by real life siblings Koki and Oshiro Maeda), each staying with one of their estranged parents in a different town. They take to their predicament in different ways. Koichi, living with his mum at her parents' in Kagoshima - a town adjoining the Sakurajima volcano - becomes more introverted and sad, obsessively wiping off the volcanic ash, wondering constantly how people could live in a place like that. His fervent desire is for the entire family to live together again, and he wishes for the volcano to erupt so he and his mum are forced to leave. The younger Ryu, living with his dad in Fukuoka, becomes almost manically cheerful and enthusiastic, zealously doing the household chores (while indie rocker dad and his buddies chill out), taking joy in gardening and hanging out with his schoolmates. While he is close to his brother he is less enthusiastic about a reunion because he does not want to relive the bickering between his parents. 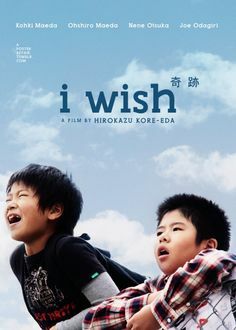 On hearing a rumor that when two local bullet trains pass each other, they generate a magic field that grants the wish of anyone nearby, Koichi hatches a plan with his buddies to travel to a point where they can witness this phenomenon and make their wish. Ryu and his friends also join in and we become part of an adventure / quest undertaken by these kids. Apart from K and R, we get vignettes of the lives of their friends, and of the elders they interact with. I blind-bought Arrow's 3-film Koreeda Set on account of the comparisons of his work with Yasujiro Ozu. In his quiet observation of people and rituals, I can see where those impressions come from, although Koreeda does not use the austere formal aesthetic that defines Ozu - the camera is not still and he does not use classic framing. But you can see Ozu's spirit in the warm and affectionate portrayal of people - the kids of course, but also the adults around them. When they go off on their adventure, the adults directly or surreptitiously help them out, and no one seems worried about them encountering pedophiles or serial murderers (Taken's Dad Liam Neeson would be aghast at this carelessness). But at the same time, Kore-eda does not go for some fake treacly happy ending in which everyone gets what they want. While the film runs somewhat long for its style and errs a little much on the side of cute (the actor playing Ryu is total Kawaii), his ability to portray kids as real people with moods and personalities makes I Wish a charming experience.